Microscopic view of domoic acid producing Pseudo-nitzschia diatom in a seawater sample from Monterey Bay, Calif. Credit: G. Jason Smith at Moss Landing Marine Labs. Despite decades of research on Pseudo-nitzschia, the molecular basis for the toxicity of these phytoplankton was not known. Scientists found that these newly discovered genes contain the biological instructions for making the toxin and are subsequently “turned on” when Pseudo-nitzschia is producing domoic acid. 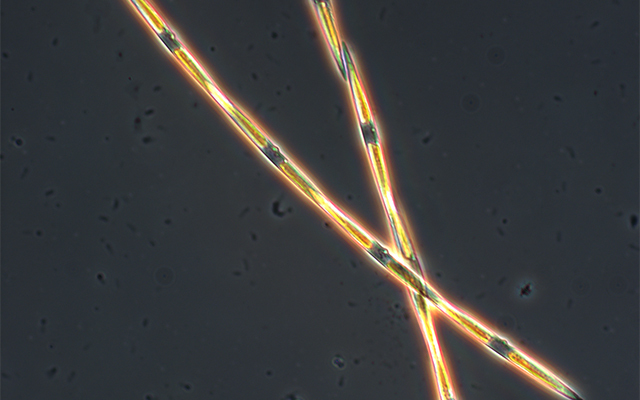 This work advanced research completed in 2011 by David Hutchins of the University of Southern California, also a co-author of this study, that found that when phosphate is limited and the amount of carbon dioxide in the ocean is increased, diatoms can make a large amount of domoic acid and become harmful. The finding was significant in part because scientists have observed that the oceans have been taking on additional amounts of carbon dioxide beyond natural levels due to societal use of fossil fuels. This and rising ocean temperatures mean that domoic acid events are becoming more prevalent, more toxic, and lasting longer than in previous decades. Scripps researchers used the results of Hutchins’ study to identify the genes responsible for the production of this toxin. Researchers at JCVI working in Allen’s lab extracted and sequenced RNA transcripts from the microalgae, an approach that measures genes that are active. Subsequent analysis of the genetic sequences encoded by the RNA transcripts identified the genes presumed to produce the toxins. In vitro biochemistry experiments conducted in Moore’s lab at Scripps then established a series of enzymes that create the core structure of the toxin. The study, “Biosynthesis of the neurotoxin domoic acid in a bloom-forming diatom,” was five years in the making. In addition to funding from the National Science Foundation, the research was supported by National Institute of Environmental Health Sciences (Grant number R01ES030316), part of the National Institutes of Health; the Gordon and Betty Moore Foundation; and the U.S. Department of Energy.